Every September, mass state-led cotton harvesting activities start in Turkmenistan. 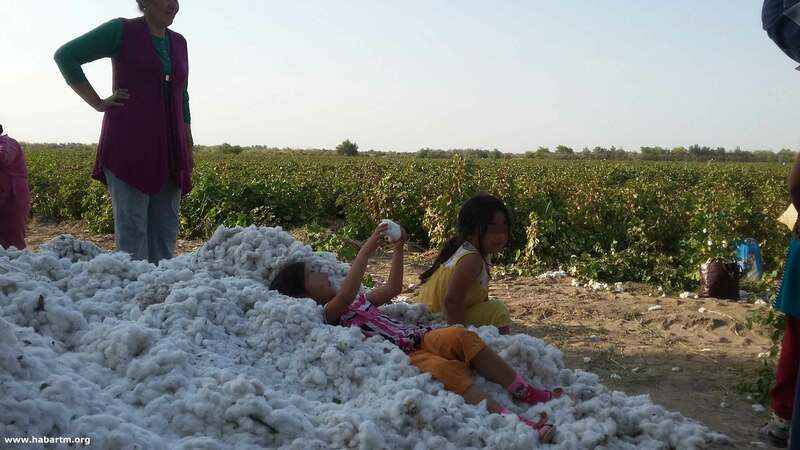 And even though the recent international campaign has resulted in large fashion retailers banning Turkmen cotton and goods made from it, and the U.S. Department of State has downgraded Turkmenistan in its annual Trafficking in Persons Report, according to local monitors, the situation with relying on forced labor to pick cotton has not changed in the 2016 harvest season. Threatening them with punishment, government officials continue forcing civil servants into the cotton fields. 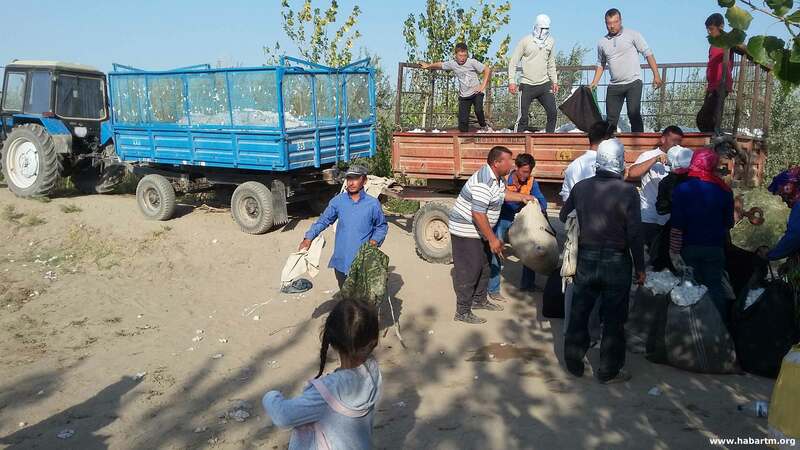 Alternative Turkmenistan News (ATN) continues to monitor the situation with cotton harvesting in Turkmenistan. ATN monitors are ordinary public-sector workers. Together with their colleagues, every day they are taken to the fields, and afterwards they send their reports. In this article ATN features a photo report from the eastern region of the country – Farab district of Lebap province. This report in Russian is available at https://habartm.org/archives/5771. Previous years’ reports can be found at https://habartm.org/archives/tag/cotton. 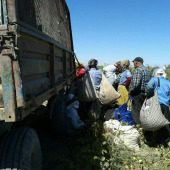 The Farab district is a backward area that is often criticized by regional authorities and the government, and therefore the local administration head Hasan Metkuliev is prepared to overlook any kind of offences and violations of human rights, only to be able to report well on the cotton harvesting targets. 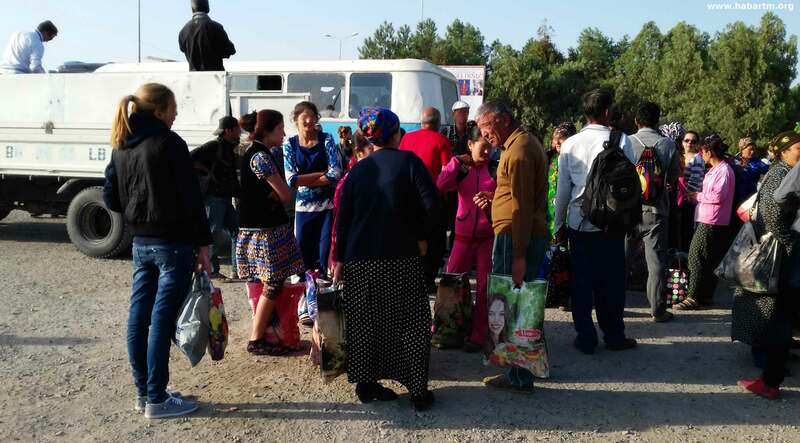 The main gathering point for Farab residents is the local railway station: the procedure to register and get into transportation that brings workers to the fields starts before daybreak and continues until about 7:30 a.m. All public sectors are represented here: teachers, healthcare workers from the district hospital and emergency unit, post office and communications center staff, culture and sports employees, staff from the Farab sanatorium and the local branch of Dayhanbank. Some offices fully close due to absence of staff; others reduce working hours to the minimum. Every September morning big crowds gather in front of the railway station. 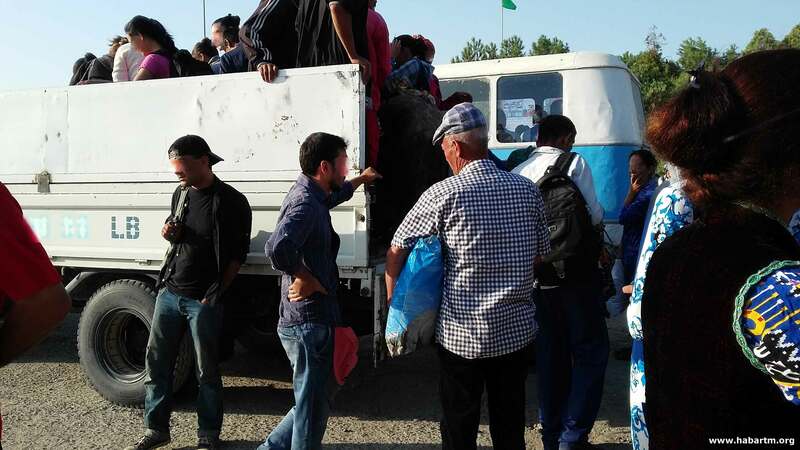 There are so many people that the authorities have to mobilize owners of the old 1970-built buses that usually run from the center of Farab to distant villages in the region, and now are summoned to take people to the cotton fields. All these buses are privately owned, and the drivers are similarly forced to contribute to cotton harvesting under threats from the road police and taxation services to ban them from private entrepreneurship. 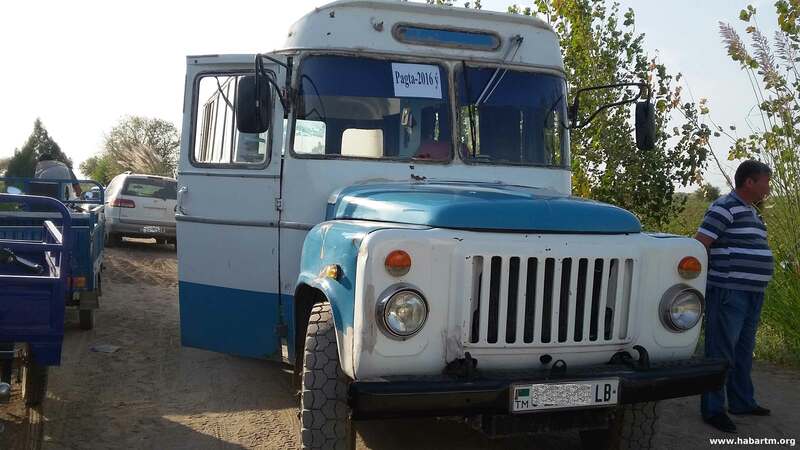 The license plates of these buses are white, as opposed to the green registration plates issued to state-owned public transportation in Turkmenistan, which leaves no doubt that buses on photos are private vehicles. However, deploying private buses has not solved the problem, and the local administration has called on owners of open-deck trucks, ordering them to transport people to cotton fields and back. “They bring people to the fields in the back of a truck, like sheep for sale. 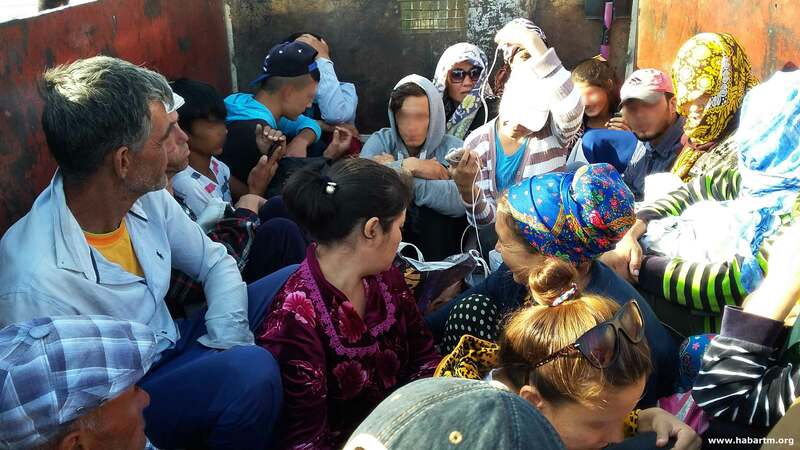 They load 20–25 people into the rear of a truck – no benches, no mattresses to sit on. Men, women and children have to sit on the cold iron floor, kneeling or squatting, all the way to the field, off paved roads, for half an hour. The rural roads are so bad that the trucks risk rolling over into the irrigation ditch,” said a doctor from the local hospital. During these trips people are not safe at all – the trucks and buses are very old and barely in running order, given that the drivers don’t have time for proper maintenance. All vehicles are overloaded; people have to stand in the aisles of moving buses, and those in open-deck trucks face even greater risks. 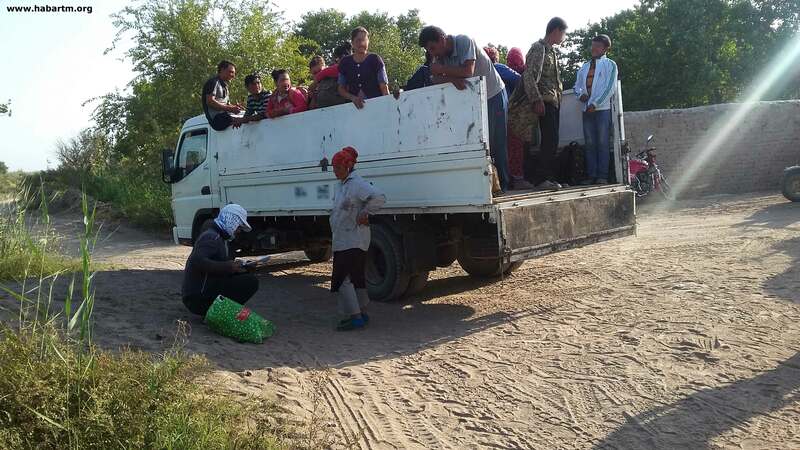 The drivers are aware that such methods of transportation are prohibited and punishable by fines, but not during the cotton harvesting campaign. The cotton production targets are to be met at all costs, and no one in the local road police or mayor’s office pays any attention to the unsuitable open decks, malfunctioning brakes or overloading of vehicles. “The road police inspector told me that I should do what I am told if I want to continue driving my truck in the future. If you dare to disobey, they will black-list you and start fining you on every corner. So, instead of carrying bricks, sand or cement we now have to transport cotton pickers,” a truck-owner told to an ATN monitor. The official media keep reiterating that cotton is the country’s national wealth, and that collecting it “to the last cotton ball” is a duty for every citizen. However, the people who are unlawfully taken away from their work to pick cotton have another opinion. One ATN monitor recites a conversation from one of the trucks on the way to the fields. The passengers were discussing the problems they faced while registering and getting into buses and trucks that morning. One of the women muttered bitterly: “If cotton is our wealth, why don’t the authorities organize cotton harvesting officially for those who need a job, and pay for it?” Many people nodded, and someone added: “If they paid them well and used suitable transport to bring them to the fields and arrange proper working conditions – many people would go!” The passengers agreed: indeed, thousands of unemployed would volunteer to harvest cotton without any coercion. But proper working conditions in the cotton fields is a dream. They use state employees as obedient slaves, making it their problem to take care of themselves out there, be it food or medical assistance. “We take food and water with us every day. If the tenant farmer arranges a boiler with hot water for us, we are more than happy: then we don’t have to find water vessels, bring water, and make fire to make tea and eat the food we brought. But not many tenant farmers take such good care of the workers,” said a nurse from the local hospital. Today cotton pickers were lucky: the tenant farmer’s children brought around drinking water from the nearest well. “When it’s warm, you are quickly out of water, and you can only get it from privately owned wells or hand pumps. Some people drink stagnant water from irrigation ditches, risking catching an infection. But what can you do if there are no other water sources around?” explained a civil servant from Farab. Due to the lack of proper conditions for work and rest, every cotton harvesting day is unforeseeable and extreme. In September there were cases of food poisoning, intestinal infections (ATN monitor has not seen washstands with soap anywhere), and cases of fainting, as people are exposed to direct sunlight and have to bend over all day. Child labor in agriculture has been officially prohibited in Turkmenistan since 2008. The President demanded to hold accountable local officials who allowed the participation of school children in cotton harvesting. Since then, mass use of child labor during cotton campaigns has not been reported in any of the regions, although this year ATN monitors have detected cases of child labor. On some of the photos children of pre-school age are seen playing on piles of cotton – it looks like their parents took them to the fields not to leave alone at home. Yet, other pictures depict school-age children picking cotton, standing in queues for weighing the harvest, loading cotton into trolleys and tramping it down. ATN monitor talked to a 14-year-old teenager from Farab. The boy is a replacement worker: he picks cotton for 10 manats [about $2] per day for his neighbor. “It’s my second season already. I work until I’m missed at school – if my teacher comes to my parents to find out where I was, I go to school for a day, and then return to the field. The teacher knows that my parents are unemployed, and that my mother, father and older brother pick cotton as hired replacement workers, and that my other brothers work in Turkey and sometimes send us money, mostly in winter and summer, when the cotton season is over and there is no other temporary work. This September I have earned 270 manats [about $54],” he said. No one in the regional administration, prosecutor’s office or department of education seems to be concerned about children working in cotton fields – whose children are they? Why are they not at school? Who is responsible for that? 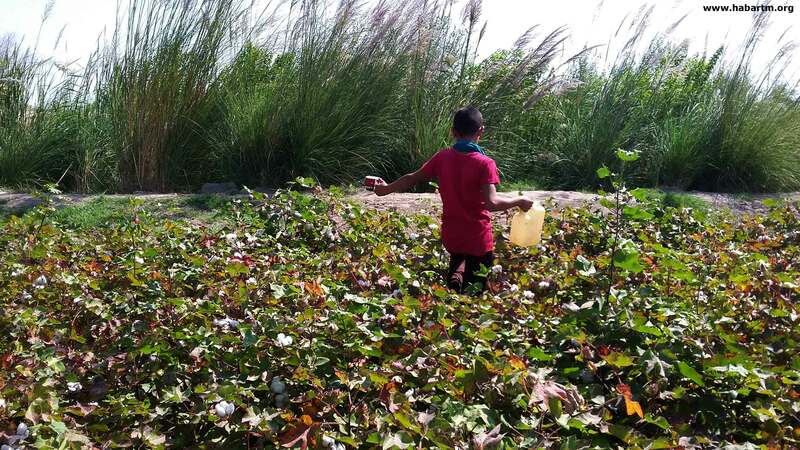 “The cotton production plan is at the top of the agenda today, and its unconditional implementation is a must, at any cost, even if it requires using forced or child labor,” ATN’s monitor reports from Farab region.